Its actually pretty simple to make, but you need to get creative on how to hold it up. I haven’t come up with the perfect way yet. We were thinking 2×4’s staked into the ground with a pole that ran between them holding up the keg, but if the pipe goes through the middle it would probably melt eventually. So for now we just have a chain attached on either side that holds it from a hook. It works, but swings a bit which is annoying. 1. Drink the keg completely and say goodbye to your deposit, cause the liquor store isn’t getting this one back. 2. Take the saw and cut the keg in half the long ways, so you have 2 even halves of the keg, this is basically your grill. 3. Decide which side will be the back and attach the hinges so that the keg can open and close freely. And on the other side (front) attach the wooden lined handle so you can open and close it without touching the keg. Its going to get damn hot when your cooking. 4. Inside the keg, cut your grill/grate so that it fits down into the keg to the point where you can get charcoal underneath it and be able to cook comfortably. Make sure its not too deep into the keg, again the metal gets hot, don’t want to burn yourself reaching too far down. 5. Find a way to mount it. As I said, you need to get creative with this part, we hung ours from a hook by chains, but however you decide to do this is up to you. 6. Load the sucker up with charcoal and lighter fluid, light, and enjoy! 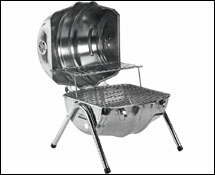 *Picture is not our Keg BBQ, but you can buy similar ones below!